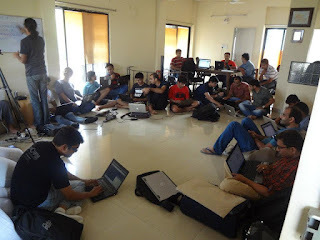 The event happened on 14 July 2012 from 02:00 PM to 15 July 2012 10:00 AM, at AmiWorks, Pune. The place is not very difficult to locate. thanks to Zainab. It was a penthouse with all minimum facilities in place. I reached there around 13:45 hours, and following true Indian Standard Time I made it 15 minutes earlier. A few hackers had already arrived and some had already started hacking the ideas! I got my self registered, pay'd the registration and fees. And then we started socializing around. During discussion, I was planning to join the group of Navin or Piyush but later found that both of them came just to kick start the event. But then during the night, got another two...Samyak and Kaustubh. Nikhil had a great idea around travel locator based on neo4j and jaideep, a web hacker has idea on visualization using d3. 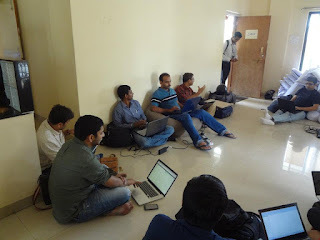 I teamed up with krishna, a php geek, and tried to build analytical tool for pages from facebook. First time dived deep and understood facebook API. Overall it was a great learning getting familiar with neo4j, d3, facebook, hadoop, etc. More important, what is a geek! Though the final analytic tool still remain a dream, it was a cool experience.